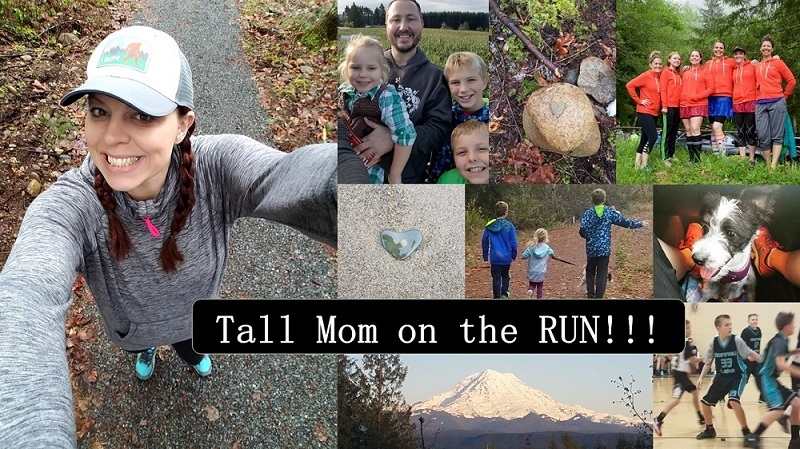 749 Tall Mom bloggy Pack Members, WOW THANK YOU!!! Welcome to all the new Members...so I have a couple minutes to share something FUN.. We got our new GIANT Pro-Form Treadmill.. And guess who loves it?? The Little Studs took turns walking SLOWLY. 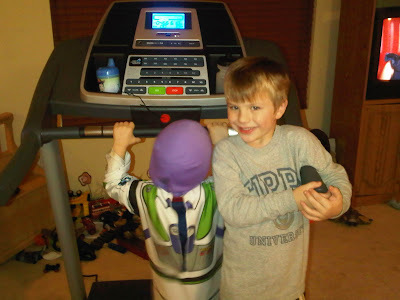 And yes Little Stud #2 was wearing his Buzz Lightyear costume, we encourage imagination and play :) I hopped on for 6 miles, caught up on my DVD Biggest Loser and Top Model (YIPPEE FOR TALL ANN), watched Muscle Man do his chest work out and answer a MILLION questions the most common asked "Mommy when is it going to be my turn?" After my run we moved the Treadmill to the back of the Loft area, not great for TV viewing but better not to have it in the middle of the play area for the boys in hopes of avoiding Lego's and Hot wheels lodged in the belt.. URGH!! I am not real sure of my opinion, so I will keep you posted.. Wonder if we will run in VEGAS tonight?? Doubtful, but I am sure to get my mileage in with a 26.2 mile jaunt around the City of Lights. HIGH FIVES to: Lesley HERE Running her 1st Marathon!, Wifey for hosting a Fun Giveaway HERE, Alanna for letting me know about her CSN Giveaway HERE, and WELCOME to blog land to a local blogger I had the pleasure of meeting in Portland Blonde Ponytail HERE. I saw your FB status of the boys on the tready! I will be anxious to hear how your like it! Muscle man won't have to worry about you on the night runs now!! Cheering for you and Amanda in Vegas!!! Have a super time in Vegas! Have a super fun time in Vegas! YAY for your new treadmill!! Yay for Tall Ann! I agree! Congrats on your new addition. AND GOOD LUCK IN VEGAS! My boys love "exercising" on ours! I try not to discourage it. I wont a flaming pink Cybex last year. I don't run on it, generally, but with the ice and dark this year, it has been a life saver! There are just times that in a busy family, the treadmill is the only solution. That's not a bad thing! Rock on in Vegas! Love the Buzz costume! Enjoy the new treadmill!!! Thank you so much for the High Five!!! Means more than you know. Best of luck to you this Sunday, as well. My littlest, Paige, always takes a turn on the tread. I usually let her on before me so it gets it out of the way and then I can focus on my run. I never want to turn her down... I love that she's excited to run!!! love that feeling right before a race. I love the sippy cup in the treadmill drinkholder!! Have a great time and a great run in Vegas. You deserve it! Run strong and have a great time in Vegas! She's a beauty! I am hoping our tax return next year will get me a treadmill. Do review once you put some hard miles on her! Your boys are too cute! Thanks for the giveaway mention!